The 860RB recumbent bike is not one of the newest models from LifeCORE Fitness; it was released in 2015. However, it still is one of their best and most affordable exercise bikes. Although it isn’t sold as a commercial machine, it definitely has the construction and sturdiness of one. It doesn’t have online connectivity, nor does it offer the possibility to directly transfer your workout data to one of the online apps, such as the Schwinn M17 270, but its console does have a fairly decent amount of programs and other features to keep you motivated. As we’ve mentioned above, the LifeCORE Fitness 860RB recumbent bike features a very sturdy construction, similar to the commercial models. Even though it’s base frame is covered by two large plastic shrouds, its chassis is completely made of steel, and the base of the seat, which supports most of the weight consists of two steel tubes. The shape of the base frame is similar to the 3G Cardio Elite RB. It doesn’t have a step-thru design, but considering that the seat is placed at the height of the average office chair, entry and exit shouldn’t be a problem. This recumbent bike isn’t extremely large. With the frame fully assembled, its maximum length is 52″ (132 cm) while its width is 27″ (69 cm). Also, in case you’re wondering, the highest point of the bike is given by the top of the backrest, which reaches 48″ (122 cm) above floor level when set in its highest position. As a small side note here, even though the bike’s L/W is 52″ x 27″, LifeCORE recommends to leave at least 24″ (61 cm) of clearance on each side and at least 12″ (31 cm) of clearance at the front and rear. This way, you shouldn’t experience any hindrance during exercises or during entry and exit. Like most other recumbent bikes within this specs range, the LC-860RB has a low center of gravity. This results in superior stability. On top of that, the bike weighs approx 107.6 lbs (49 kg), which is more than twice the weight of a road bike, an aspect which also adds to its overall stability. Plus, its rear base bar features rotating stabilizer. This exercise bike doesn’t fold. However, its relocation shouldn’t be a problem. Its front base integrates two small wheels for this matter. One last aspect to mention here regards the bike’s paint finish. All the steel parts in its frame construction are coated with a corrosion-resistant powder finish, black in color. As opposed to many other recumbent bikes which have a chrome finish on the seat bar, or an aluminum seat bar without any finish, this bike has the same black coating on the whole metallic seat assembly. The main element that supports most of the user’s weight is the seat. So, the first aspect to mention here is the bike’s weight capacity. The LC-860RB is equipped with a very durable seat which can hold users up to 300 lbs (136 kg). The seat is approx. 18″ (45 cm) wide. It integrates 2″ inches of foam padding in order to deliver superior comfort. Its upholstery is made of a durable vinyl material, with reinforced stitching. The backrest features a mesh, flexible structure, in order to provide maximum breathability and to adapt perfectly to your body. It doesn’t recline but does offer 6 height adjustment positions. In terms of handlebars, the bike has two sets, one attached to the console mast, and one to the seat. The seat handlebars incorporate pulse sensors. Both handlebar sets have rubberized grips for optimal comfort. The whole seat assembly including the backrest and the handlebars slides on an oblique rail. It can be locked into position closer or farther from the pedals. The adjustment is done via the small lever under the seat. So, these being said, the bike can accommodate users between 5’0″ and 6’5″ (153 – 196 cm). The main elements of the bike’s drive system are its belt, flywheel, pulley, crank arms, and pedals. As opposed to several other recumbent bikes. The LifeCORE Fitness 860RB has the flywheel situated at the rear, under the seat. It’s a medium-weight, perimeter weighted flywheel, designed to deliver a consistent momentum and a smooth pedaling feel. 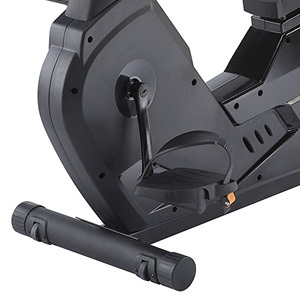 Since it’s a magnetic exercise bike, it comes with a belt drive system. It uses a fairly long poly V-belt, which connects the flywheel to the pulley. The belt doesn’t require any lubrication. Also, its quieter than a chain drive, and minimizes vibration. The bike is equipped with a large pulley attached to the front part of the frame. The crank arms are made of durable steel material, while the pedals are also metallic but encased in a nylon shell. The pedals are large, weighted, and feature adjustable straps. The bike’s Q-Factor (spacing between the pedals) is not specified. However, it’s a narrow Q-Factor which eliminates the lateral stress on the ankles. Also, since this is a recumbent exercise bike and most of the user’s weight is supported by the seat, the up-to-down stress on the joints is minimal. 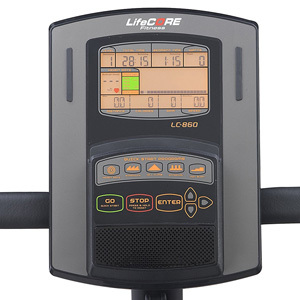 The LifeCORE 860RB has a motorized magnetic resistance system. The resistance elements are a magnetic brake and a servo motor. The bike’s resistance can only be adjusted from the console, and for the console to become operational, the unit must be connected to a power circuit. An adapter with cable is included with the bike. Its connector is at the rear of the machine, above the base bar. When you select a resistance setting, the servo motor will shift the position of the magnetic brake in relation the flywheel, generating more or less resistance. 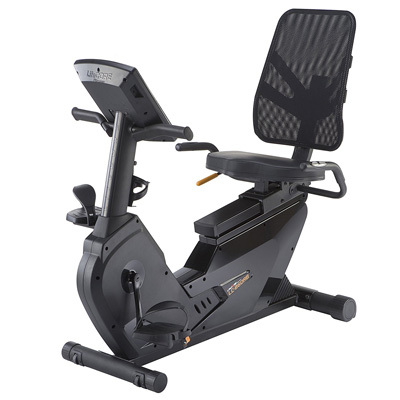 This LifeCORE fitness exercise bike offer 16 levels of resistance, similar to the ActionLine A87604 or the LifeSpan R3i. It’s made for light to medium intensity workouts, so the first few levels offer a very light resistance, recommended for rehab training, or for users with disabilities. Conversely, when using the 15-16 levels of resistance, the difference is noticeable; by training on these resistance levels you will obtain a more consistent muscle burn, and a more intense cardio training. Since the bike is motorized, some of the preset programs automatically change the resistance. For example, if you’re going to use one of the Hill Climb programs, the resistance will increase gradually, and decrease abruptly or also gradually, depending on the program. 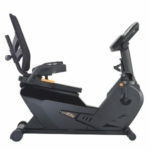 As we’ve mentioned above, the console supplied with the LifeCORE 860RB recumbent bike does not have online connectivity. However, it does have 22 programs to keep you motivated. The programs are split into 5 distinctive categories, which are Strength (4), Hill Climb (5), Interval (5), Fat Burn (2), and Heart Rate (5). Along with these programs, the console also offers three user profiles, which give you the possibility to create and save up to three distinctive, custom workout settings. The console is equipped with a large LCD, backlit display, divided into multiple tabs, each tab showing one workout metric. In other words, the console display shows time, distance, speed, RPM, Watts, calories, heart rate, and the selected resistance level. The larger panel covers the workout segments of the program in use. For distance and speed, the unit can be set either for metric and imperial units. However, when it comes to heart rate, the console is not telemetric. Differently put, it can only track your pulse via the sensors in the seat’s handlebars. It does not work with Polar (or other models) HR chest strap transmitters. Also, for the profile creation, the unit will prompt you to input personal data such as age, weight, etc, in order to determine better your calories burned and Watts output. There are several non-fitness functions on the console as well. These are the Hi-Fidelity sound system, the tablet holder, and the USB port. The sound system is placed at the bottom of the unit. It’s compatible with most MP3 players, smartphones or tablets. Although the sound rendered by it is not extraordinary, it’s still better than the sound provided by most smartphone speakers. The tablet holder is placed above the unit’s keypad. There are two rubberized small pads, one on each side of the display which serve as stabilizers for your tablet. Also, the unit has a USB port, for charging your device. The USB port does not support workout data transfer. 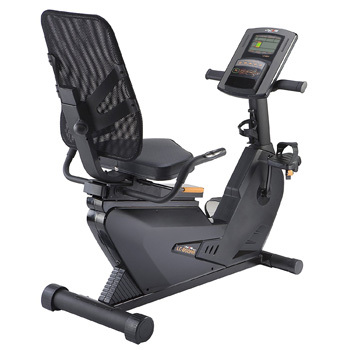 The main body of the LifeCORE RB860 recumbent bike comes pre-assembled. You only need to attach the base stabilizers, the seat, the backrest, the seat handlebars, the console mast, the front handlebars, the console, and the pedals. This shouldn’t take longer than an hour. A basic toolkit for assembly is included. Plus, the manual provides excellent assembly instructions. Maintenance doesn’t require much. The internal parts are pre-lubricated and since it’s a belt drive bike, its transmission doesn’t need periodic lubrication. So, basically, you only have to keep the bike clean, keep liquids away from the console, and periodically check for loose parts. The console is not telemetric. The LifeCORE Fitness 860RB is a motorized magnetic recumbent bike, offering 16 resistance levels and 22 workout programs. It has a sturdy construction being able to support users up to 300 lbs. It’s equipped with an ergonomic, adjustable seat with mesh backrest. 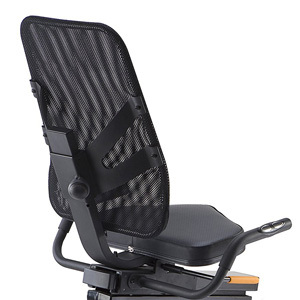 Its backrest also has 6 height adjustment positions. It’s an excellent bike for light, medium and even intense cardio training sessions, stamina training, weight loss, and intervals. And finally, even though it does not have any online connectivity features, and is not exactly an affordable bike, it still does offer excellent value for the price.